Saree has always managed to crave niche for itself. Penchant fashion savvy woman of today’s generation choose sarees over all the other attires. The 6 yards drape is the hot pick of every woman the reason being saree flatters the feminine body and shape and helps in accentuating the curves of woman so that she looks gorgeous and sensuous at the same time. Saree is timeless attire; in the fashion savvy world where the fashion changes every minute 6 yards drapery has never lost its charm and is considered the most stylish ethnic Indian attire. The ethnic saree is no more ethnic the designers have completely revamped the look of Indian sarees. The B-town Divas are also in love with designer pieces and often seen draping the six yards in new ways which evokes style statement for other fashion obsessed woman. To watch a woman drape saree sensuously is definitely a feast to watch, men always have loved and admired woman in sarees. The craze is such that today even teenage girls love to flaunt their curves in this amazing drapery which is tightly draped and looks like the second skin on the body. If you are bored with the traditional sarees then there are many other types of sarees that designers have come with that simply look stunning. 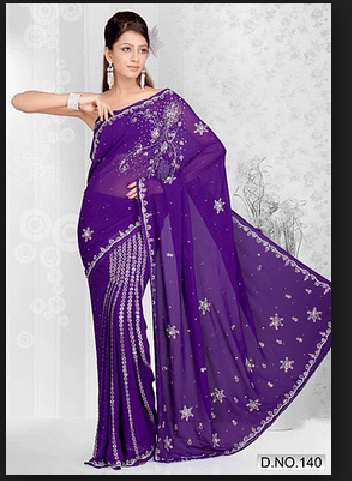 You can gain access to such sarees for woman online. Pre pleated and stitched saree: This style of saree can be worn in a jiffy as the pleats are already done and stitched. These sarees are customized and designed by designers the pleated section comes with work and embellishments to highlight. All you need to do is drape it on waist no need to pleat and throw it on shoulders and look super stylish. Lehenga style saree: This type gives an illusion of lehenga but is a saree so it can be draped easily. This will make you look like a fashionista, you will steal the attention wherever you go with this awesome saree style which speaks opulence and elegance. Prestitched pallu saree: This style of saree is quite in vogue in this style pallu is stitched and narrowed fully and to highlight the look usually these saree have work on shoulders. If, you have figure to die for this style of saree is perfect, as this will flaunt your slim waistline and curves too. Go ahead and change the way you drape the 6 yards with these stylish sarees that are highly trending. Look different look stylish with these glamorous sarees. You can buy designer sarees online easily from stores like Indiarush which has latest designer sarees and the stocks are updated on a daily basis. Why search pillar to pole for exclusive sarees where you can shop from the comfort of home. Choose to look unique from crowd and create your own fashion statement with these sarees.